This all-new induction range has 5 high-power heating zones with maximum power output of 3700W. The right-side heating zones can be bridged to create a larger cooking area. Each induction area is controlled with knobs and has a convenient read-out interface on the glass worktop. 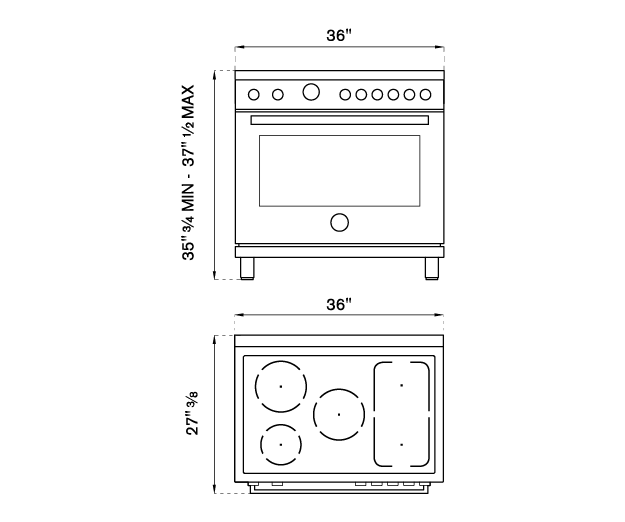 The 5.7 cubic feet self-cleaning oven is the largest in its class, with dual convection fan for balanced airflow and even temperature baking and roasting on 7 shelf levels. The elegant digital temperature gauge monitors the actual temperature in the oven and has integrated controls in the bezel for the food temperature probe. The extra wide electric broiler with optional convection is ideal for grilling and searing at high heat. The oven includes convenient features such as smooth telescopic glides for the oven shelves and soft-close doors. The edge-to-edge interior oven glass door maximizes interior volume and can be wiped clean without effort.